Director Robert Aldrich (Kiss Me Deadly) and screenwriter Christopher Knopf team up for the spectacular Depression-era tale, the 1973 action-adventure drama Emperor of the North. 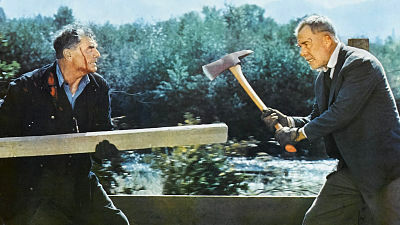 The movie features a pair of stalwart veteran actors, Lee Marvin (The Killers) and Ernest Borgnine (Convoy), as, respectively, a jaunty hobo determined to ride a train and the vicious conductor equally resolved to prevent this eventuality. Also starring Keith Carradine (The Long Riders) as the train-jumper’s young protégé, the film features a potent score by Frank De Vol.